Home > Politics > Land > Whose Land is it Anyway? Evicted Family, Lochmaddy, Outer Hebrides, 1895. © Scottish Life Archive, National Museums of Scotland. An earlier version of this article was published in the Oxford Left Review in 2014 under the headline Whose Land is it Anyway? — Radical Land Reform in Gaelic Scotland. It was in my last year of primary school I realized I was a socialist and a radical. We were learning about the Highland Clearances – Fuadach nan Gàidheal, the Expulsion of the Gaels – which saw tens of thousands of people forcibly transported overseas or evicted to the overcrowded, rocky coast in the name of economic progress. And then the bombshell: the estate owners, the landed classes who had tried to empty half of Scotland, were still here, hunting, fishing, and landlording it over the natives in the 21st century. But not for much longer. It was 2005, and the island I grew up on – Eriskay – was bought, alongside neighbouring South Uist and Benbecula, for £4.5 million, not by another syndicate of deerstalking families, but by people of the islands themselves, to be held under community ownership. It was the culmination of over a century of struggle, of which most of Britain – reared on tourist-friendly tales of the wild ‘heilans’ – is completely unaware. After the Clearances of the 19th century, crofters in the Highlands and Islands – inspired by the Land League in Ireland – began to campaign for rights of tenure. The Highland Land League had as its slogan “Is treasa tuath na tighearna” (The people are mightier than a lord), and with its newspaper An Gàidheal (The Highlander), inspired and organized radical action such as rent strikes and land raids. In 1882, after having been denied access to what they saw as their rightful common-grazing land on Ben Lee, the crofters of the township of Braes on Skye, with their wives and children, fought the police who had been dispatched to extract rent from them. The ‘Battle of the Braes’, as the newspapers dubbed it, inspired similar acts of resistance in Skye and Lewis. In response, in 1883, the Napier Commission took evidence from crofters all over Gaeldom of landlords’ abuses during the Clearances and after, and public opinion began to turn in favour of the crofters. In 1885, the Highland Land League returned four MPs, becoming Britain’s first ever working class MPs, and the ruling Liberal government was moved to pass the Crofter’s Act of 1886, which guarantees security of tenure and inheritance to crofters. Yet, though this legislation succeeded in its aim of preventing a repeat of the Clearances, the inequitable pattern of land occupation prevailed. Thus, land raids continued apace until 1914, and peaked after the First World War, when soldiers returning home from the Front discovered Lloyd George’s manifesto promise to forcibly buy land back from the landlords to be illusory. Gaelic Scotland suffered some of the highest casualty rates in the British Empire, and understandable bitterness drove direct action modelled on the Vatersay Land Raids of 1906. However, despite landlords being forced by default to give land up to the raiders, these direct actions did not solve the fundamental problem that was feudal landownership. Land reform stalled until the 1970s, when the agitprop theatre company ‘7/84’ and the radical (now the UK’s first wholly employee-owned) newspaper the West Highland Free Press inspired the people and politicians to finally tackle the issue that 84% of Scotland was controlled by just 7% of the population. Finally, after the people of Eigg bought their island from an absentee landlord, the Scottish Government in 2003 legislated for a right to buy, so that any community that so desired could buy their own land back, even against the wishes of the landlord, making radical land reform a right in law. But the quest for a fair pattern of landownership has not been easy. 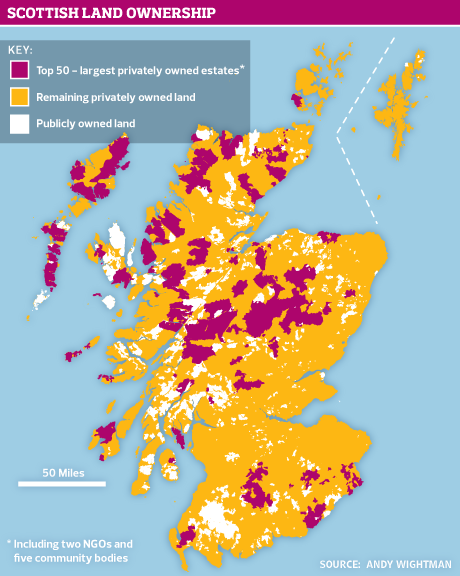 432 private owners control half the land in Scotland, a quarter of the country is still sporting estate and, as Figure 1 shows, much of the Highlands remain in the hands of the 50 largest estates. The community of the 26,800 hectare Pairc estate on Lewis, whose starving ancestors took part in the infamous Deer Park Raid of 1887, fought in the courts for over ten years, and only now in 2013 were able to come to a deal about purchasing the land from an obstructive landlord. Landlords have begun to speak out, defending themselves. In BBC Scotland’s The Men Who Own Scotland, broadcast in January 2014, James MacKenzie, defended the fact he owns 53,000 acres across Scotland by quipping “it may not be fair but is it fair that your wife is prettier than mine, that you win the lottery when I don’t?” This kind of fatalism, which presumes landownership patterns arising unjustly in the past should just persist for the sake of preserving the sanctity of private ownership, has retarded progress for decades. But the Scottish National Party (SNP), led by environment minister Paul Wheelhouse, after years of avoiding what in Gaelic is termed Ceist an Fhearainn – the Question of Land – have decided to face up to what James Hunter calls “the most concentrated, most inequitable, most unreformed and most undemocratic land ownership system in the entire developed world,” by, for example, giving tenant farmers the undisputable right to buy the land they work from even unwilling owners. And Lesley Riddoch, an influential nationalist journalist and thinker, in her book Blossom, has named these land reforms as a major priority for social justice in an independent Scotland. Yet community ownership has not turned out perfectly. In its early years, the elected board of Stòras Uibhist, South Uist’s community estate, was riven by scandal and power-plays. Other communities have struggled to find the required funds to purchase land. And there are questions to be asked of whether lottery money is best spent benefiting a few hundred islanders rather than thousands of deprived people in urban areas. However, economic and infrastructural improvements have been fast in coming. South Uist has seen substantial developments in harbours in Loch Boisdale and Eriskay. On Eigg, only after the buyout did the islanders have access to regular electricity, through the building of a community windfarm. The West Highland Free Press has as its slogan An Tìr, an Cànan, ‘s na Daoine (The Land, the Language and the People), showing how intertwined issues of cultural and territorial decolonization are, even if in practice they haven’t always been viewed so. Over the past century or so, Gaelic -speakers have dwindled in number from 230,806 in 1901 to 57,375 in 2011. By 2011, only 51.7% of Gaels were living in so-called ‘heartland’ Highland areas, and the incidence of Gaelic-speakers in the language’s last stronghold of the Western Isles was now just at 52%, a 10.5% drop since 2001, showing the effects of wholesale language shift, depopulation and Anglophone in-migration. The modern geography of Gaelic is summarized in Figure 2. Anecdotally, I first began to explore ideas of indigenous land use to understand Gaelic Scotland after meeting Alastair MacIntosh at an Eco Film Festival in Uist in 2010. I was taking part in a panel discussion alongside MacIntosh, a geographer from St Andrews University, and an (incomer) representative of Sustainable Uist, a sustainable development organization from the Western Isles. The crowd was large by Hebridean standards and there was much self-flagellation among the assembled academics and eco-activists about how hard it was to get local crofters involved with their sustainable development schemes – indeed not one crofter had even turned up to the Eco Festival. I vividly remember the perplexed silence when I pointed out that the weekend they had chosen to host the festival on coincided with one of the busiest weekends of the crofting calendar, when the livestock were moved to the common grazing, so no wonder no crofters had put in an appearance. Presumably this was because of some kind of social divide that persisted between environmentalist ‘white settlers’ and the indigenous crofters, and showed the problem of allowing the debate over Highland development to be dominated by outsiders. ‘White sterilizer’ culture sees the value of the Highlands as a wilderness as trumping economic development or active land use. For example, Scottish Natural Heritage, buttressed by the John Muir Trust, recently drew up a map of proposed wildland designations in Scotland, scenery deemed too precious for development. As Figure 3 shows, this includes a huge swathe of South Uist community estate. Yet it’s no use wresting back the land from the landlords and the seabed from the Crown if environmental agencies just turn round and tell poverty-stricken communities like the Western Isles that they can’t do anything with it. When the Scottish government decided to designate the area around my island as a Special Area of Conservation, they put the fish ahead of the people – despite the fishermen marching on Edinburgh to defend their livelihoods. When crofters were banned from shooting the birds who ruined their crops, wildlife groups gave more value to geese than Gaels. When animal rights activists attack the men of Ness in Lewis for harvesting 2000 guga chicks a year, they choose a tiny fraction of a massive colony of seabirds above deprived islanders living in the most distal part of the UK. And when land that’s been settled for centuries is called wildland, when the government embraces the ideology of the Highlands as a wilderness, Scotland is entrenching and upholding a vision of Highland land use belonging to the age of Clearance. who were driven over the sea. The year is 2014, and this September, Scotland faces an existential choice over independence. If Scotland votes yes and brings its people autonomy, but leaves the land of Scotland in the hands of the landlords, then Scotland will not be an independent state worth living in. Interesting exploration of the dynamics of the debate in the Highlands. Just one point of correction. The 7:83 Theatre Company’s name did not derive from the fact that “84% of Scotland was controlled by just 7% of the population” It was derived from a 1966 statistic (published in the Economist as I recall and derived in turn from Royal Commission on Wealth and Incomes – though I need to check that) that 84% of the wealth in GB (or UK – again I’d need to check) was owned by 7% of the population. In other words it had nothing to do with the distribution of land in Scotland. Were the name to be derived from the latter, then it would be more like 0.1:85 – 5000 own 84%. 7% owning 84% would in fact be a stunning improvement – expanding landownership to 350,000 people! Thanks very much for taking the time to read and for the correction. I will change the text on my blog, and hopefully Bella will too. p.s. As you can imagine, I am a big fan of your work! Math fhéin. Sàr sgrìobhadh agus gach puing cho soilleir a thuigsinn. Móran taing airson seo a chur air loidhne. Tha sin glé chuideachail. Regarding “Our islands Our Future “there needs to be a different kind of democracy before that will be useful. At present it’s a romantic slogan for handing more powers to what are, here in Orkney at least, a collection of the powerfully incompetent. A similarly romantic view pervades some of this article along the lines of “the local sons of the soil know best” it ain’t necessarily so. Sorry to say, but Im not one for buyouts i see this as a form of reset and just as disagreeable as wealthy people buying our land. Title deeds were never required in past times and their creation is maybe where we should start to analyse how the land was taken from the native people. To my mind a good place to begin would be to ask for the original title deeds attached to which there should be thousands of small bills of sale concerning the purchase of land from individuals or groups this might help verify initial ownership. Otherwise, imo it would appear that the land was stolen. As someone who’s family were driven out of Glen Tilt I won’t my land back. My thoughts on the subject of regaining the land stolen, is a penny of compensation and I think even that to be too much. My view is that we all ought to have 10 acres. That’s enough to provide food and clothing for a modest input of time and materials. Since I don’t have any acres, someone else has mine! Some kind of money transfer needs to be set up whereby the value that has been purloined can be returned. I’d be happy with that. We used to charge local rates until the poll tax was introduced and large estates were exempt from having to pay for their land. No doubt some lobbying in the House of Lords went on to ensure that the beneficiaries of the clearances and their noveaux riche pals can continue to enjoy their property without cost. Why should communitiies buy their land? Why should people buy land stolen from their ancestors? The big estates should be sequestrated and redistributed to communities and individuals or families whose ancestors were driven off. Land should not be owned, not by anybody and not by the state. As a Christian I believe that Land should be a stewardship from God. He/She owns the land. A caricature of conservation. You don’t need to find bogey men to make the case. A very interesting and much-needed polemic (although I’m not convinced my lowland ploughmen ancestors felt any differently about their relationship to the land). We might (hopefully) achieve some measure of land reform, but there won’t be a Gaelic Scotland to see it. The language is done for I’m afraid; we’re in the midst of the last stages of appropriation and quangotisation just now. A few weeks ago the great American Gaelic scholar, Michael Newton, sent me an email in the course of which he commented at his delight that there’s now a growing number of younger scholars and activists, not of our increasingly crusty generations, that are taking up the cause and being inspired by the fire of land reform and its attendant community regeneration. As I was reading your article and thinking “this is great stuff” I was scratching my head, wondering who you were, another of these younger scholars, then you told the story of that film night. I too remember the stunned silence. It was a great moment, embarrassing perhaps for the organisers, yet if they’re incomers of the type who will last and come in due course to belong (the twin sacred duties of hospitality for the short term, and fostership for permanence), then they’ll not trip up over their embarrassment. Such happenings can be transformative points in learning, and growing. There is much I could comment on here (and I should say I’m not native to Lewis, but was raised there from the age of 4, and the real champion of the crofter/indigenous perspective is more my colleague Iain MacKinnon of Skye), but I’d rather save that for a blether in person at some point. I just want to say that when I first heard you speak at that film event you were still a school student – the dux, if I remember rightly – and I could see why you were so. Keep on journeying in the direction you’re going and you’ll give a lot of us veteran land reform campaigners good reason to raise our dram in a toast if our stomachs are still up to being doused in the stuff. Go well, and do drop me an email in person if you get the chance so we can stay in contact. It is music to my ears to see the deep culture – the Duthchas – being carried on. This is of an importance far beyond the isles, and thus the isles’ justification in the wider world. This is music to my ears, strength to my hands & hope for all the other bits! Thank you for writing Dòmhnall. Pingback: Whose Land is it Anyway? | Doodle's doodles. I’ve seen the image accompanying this article a few times and am always moved. With ancestry from Lochmaddy in North Uist I find a special resonance. Is that a person in the foreground or a doll? If a real person, is she sleeping or dead? I became aware of what went on in Scotland since the XVIIIth and XIXth centuries by reading Peter May’book called Entry Island. I had a long time ago been sensitive to Irish clearances but had no idea of what went on in Scotland in the same period. Feudalism, clan run estates, slavery to the crofters in that part belonging geographically to our continent. A real eye opener. Throughout years at the UBO ( Université de Bretagne Occidentale in Brest-France) I have been trying to learn to write and read my own mother tongue, Breton, which was discriminated by the French State for so long ( still is). I learned Welsh too but had to give up Gaelic as it implied so much work at a time I had to make a living. I was too young but would I have had to go thru Celtic studies again, I would certainly give Scotland a second thought. Next time I go to Scotland, I will certainly approach your country with a much different outlook.